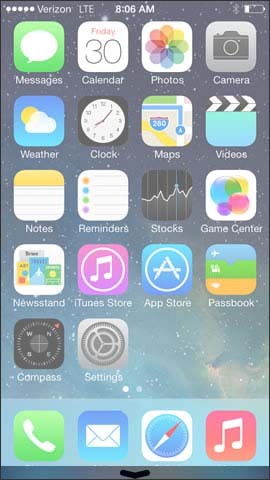 From the Home screen, touch and hold the Control center (bottom of the screen). 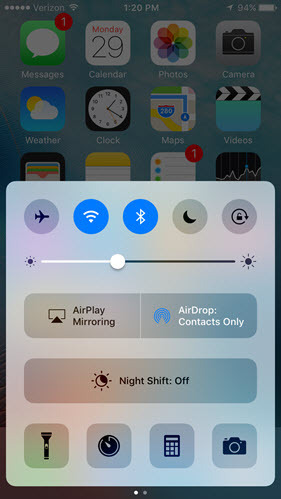 Swipe the Control center up towards the top of the screen. Tap the Airplane Mode icon to turn on/off. Tap the Wi-Fi icon to turn on/off. Tap the Bluetooth icon to turn on/off. Tap the Do Not Disturb icon to turn on/off. Tap the Portrait Orientation Lock icon to turn on/off. Adjust the brightness level as desired. Tap this to mirror your iPhone on an Apple TV. Tap the Flashlight icon to turn on/off. Turned on when icon is highlighted. Tap Start to start timer and Pause to pause timer. For assistance with using the camera, refer to Send Picture Message.